Keeping with my love of edible houses, may I present the gingerbread Farnsworth House, courtesy of cake designer April Reed. The New York Times recently did a piece on this yummy version of Mies van der Rohe's modern classic and I instantly feel in love with it! 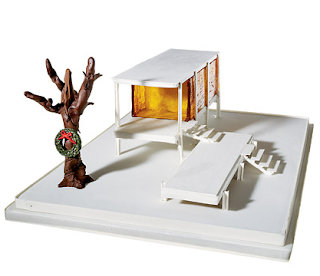 Of course, the price tag on this mini-house is $4,320, so it won't be sitting on my kitchen table anytime soon. On the plus side, 15 percent of the proceeds will be donated to help repair the much larger Farnsworth House in Illinois, so at least you'll know that some of your hard-earned money is going to charity. Click here to check out the piece in the New York Times and here to visit April Reed's Web site. Wow that's edible? I'm guessing the wreath is the tastiest part.